The Network Joint Research Center for Materials and Devices has been established in 2011. 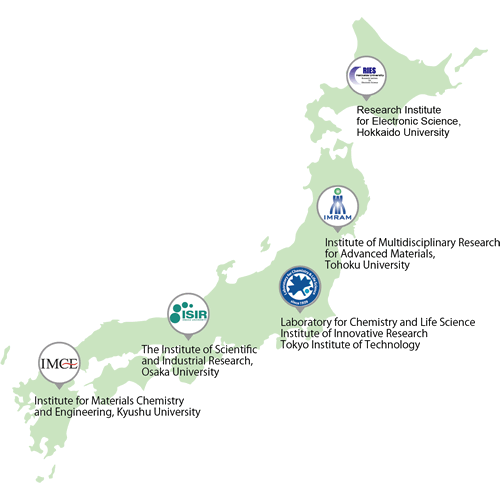 It links together 5 Research Institutes across Japan Archipelago：Research Institute for Electronic Science at Hokkaido University (RIES), Institute of Multidisciplinary Research for Advanced Materials at Tohoku University (IMRAM), the Laboratory for Chemistry and Life Science, Institute of Innovative Research at Tokyo Institute ofive Technology (CLS), Institute of Scientific and Industrial Research at Osaka University (ISIR), and Institute for Materials Chemistry and Engineering at Kyushu University (IMCE). The objective implies organization of a "network type joint research center" and a "problems solving type alliance" promoting cooperation between CORE Labs. The "network type joint research center" means that five research areas: Nano Systems Science, Substance Creation Development, Material Histochemical, Nanoscience and Devices, Materials Functional Chemistry, form a new area "Materials and Devices" joining these 5 research areas into one network and preparing the necessary environment for a joint research system. According to the 2015 application data, 53 regular joint research projects were running this year. In addition, seven research teams were selected on the basis of the "CORE Lab" system which implies involvement of the young talented researches into joint projects. This promoted the interdisciplinary studies significantly. Thus, we sincerely hope that the competitive organization of the joint research strengthened by specific features of this network would propagate rapid development of the studies in "Materials and Devices" field in Japan. A system of “Joint usage・Joint research” means that the single university level in usage of important equipment, information and data is overcome, and their joint use by research institutions of the whole Japan becomes possible. This system encouraging joint research, contributed significantly to the development of science and technology in our country. Previously, this system was mostly developed on the basis of the equipment concentrated in the Research Institutions affiliated to the National Universities. However, in order to promote development of Fundamental and Applied Research within the whole country and increase the potential of the university research, it was necessary to extend the “Joint usage・Joint Research” system for all universities including National, Private and Public ones. For this purpose, The Ministry of Education, Culture, Sports, Science and Technology established in July 2008 a new organization, viz. “Joint usage・Joint research Center” thus creating a uniform system for National, Private and Public Universities. With introduction of this system, the “Joint usage・Joint research Centers” were established for broad range of scientific disciplines that strengthened the base for fundamental and applied investigations and promoted emerging of new research in our country. On April 1, 2017, 105 “Joint usage・Joint research Centers”were operating in 53 Universities (28 National, 25 Private or Public).